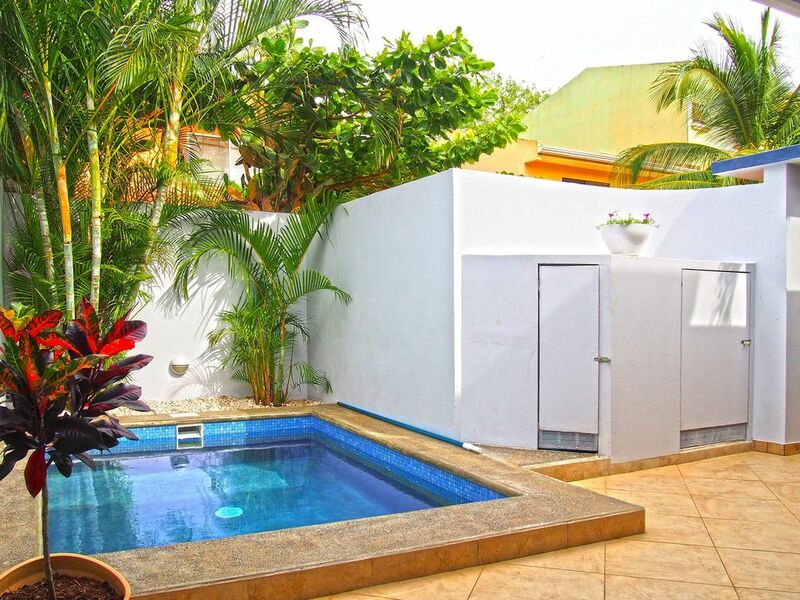 Villa Thoga is your ideal resting oasis in the heart of Tamarindo. The beautiful Tamarindo Beach is only 250 meters away. The home is located centrally, very quiet and secure, fenced by a wall. All you need is only a few minutes’ walk away. Villa Thoga can accommodate up to 6 people. All rooms have A/C. On the second floor, there are two spacious bedrooms, each with its own bathroom. All bedrooms feature a King Size bed with orthopedic mattresses to ensure the best sleeping comfort. Two additional guests can sleep on the big sized, comfortable sleeping sofa on the first floor. On the first floor, you find the living room and the generous kitchen/dining room area. Enjoy watching a game of your favorite sports team on the big Flat Screen TV with Dolby Surround Home Theater. Do You want to cook at home? No problem. The kitchen is fully equipped with a big refrigerator with icemaker and freezer, an electric stove (Küppers Europa) with a Ceran cooking top (Schott) and touch screen. Also, there is an oven, a toaster, a blender, a microwave, a coffeemaker as well as plates, cups and silverware. A true highlight in the outdoor area is the Splash Pool, completely hidden from views. The ideal spot to end the day with a tropical cocktail. Sunbathing or enjoy some shade? No problem. Just choose one of the two spacious terraces. The BBQ and outside dining area are optimally completed by a Weber Grill. We were looking for a country where it's always warm and wanted to live close to the sea. After a three-month stay here and a Spanish course, we have sold our belongings in Germany and emigrated to Costa Rica. We bought this house because it is built in a European style, located close to the beach, shops and restaurants but in a very quiet and private and of course a secure area. If you like to spend your holiday with your friends or family in a very private area this is the best vacation home. You will find a fully equipped kitchen to cook your own meals furthermore there is a BBQ (propane). And if you like to enjoy a meal in one of the 90+ restaurants in Tamarindo or the nightlife it is a 5-minute walk. The house is fenced by a wall, located on a private street, no traffic, and no pedestrians. Private and secure parking off-street in front of the house. The villa was recently renovated inside and outside and has modern furnishings. all rooms have A/C, all water connections have hot water. You will have beach chairs, beach towels and a cooler for a comfortable stay on the beach. The bathrooms have a shower, hot water. We provide toilet paper, towels and hand wash soap at each sink. Please bring your own toiletries such as shower gel, shampoo etc. Secure Parking (1 car) in front of the house in a private street. paper towels, salt, pepper, oil, dishwashing liquid, kitchen towels and a starter kit with coffee, tea are provided. BBQ and outside dining area in the patio with 6 seats. the nearest golf course is Hacienda Pinilla, only a 15-minute drive by car. A desk and chair are available. For a comfortable stay at the beach: beach chairs and beach towels are provided. Awesome place within walking distance of the beach, stores, and restaurants! Villa Thoga was the perfect Tamarindo getaway! It was clean, comfortable, and convenient. It was nice to have the benefits of a home, while in a foreign place. We utilized the kitchen often (with all cooking essentials and hardware), but we also went out to appreciate what the town and tico lifestyle had to offer. The pool was prime for cooling down and the lounge chairs and outdoor table made the gated courtyard very comfortable. Having a locked gate was also great piece of mind. Not to mention, AC was a lifesaver! The house cooled down quickly and was the perfect temperature for winding down and watching a TV show in the living room area. It was nice to be surrounded with reliable appliances and fixtures throughout the home. The dining and activity binder was full of suggestions for our stay. That coupled with Gaby's personal suggestions and advice made decision making easy! Contact with hosts was quick and pleasant. We knew we were in great hands the entire time. We traveled with another couple and we all agree that we lucked out with this find. The location was ideal for our needs and wants. It's perfect for beach time and exploring the town. We would definitely stay here again! Thank you so much, Mariell for this amazing review. Thank you so much for this amazing review. It's always great to have guests who are so friendly, communicative and treated the house just like their own. We are happy when you are. It was a pleasure for us to have you in our home and we will be glad to welcome you again. The stay was amazing. We were there April 5-12, 2016. It sits in a little cul-de-sac which adds to privacy and security. You will not meet any nicer and helpful owners than Thomas and Gabby. The photos are a true representation of the villa. The pool was a great bonus after coming home from the beach on hot days. The gas grill made our cooking out feel just like home. I WOULD DEFINITELY CHOOSE TO STAY HERE AGAIN! For the amenities and the helpfulness of the owners this place cannot be beat. 3 minute walk to beach and very secure. This Atlanta girl WILL BE BACK. HIGHLY RECOMMENDED! THANK YOU so much for this amazing review, Christian. It was a pleasure to welcome you and to have you as a guest. We really appreciate it when you come back. Thomas and Gaby, this house was perfect! The location is ideal. It is close to town and our new favorite little bar, Wild Panda, which also has amazing food. Also, it's just far enough away to get that neighborhood quite time. The gated front wall offered privacy and security, so we never worried about our belongings. Thank you for all your recommendations for places to eat and drink. We really enjoyed the pool and patio area, which was perfect for cooling off at all times of the day. We had everything at our disposal and you both were so friendly and quick to respond to my questions. Thanks again! Pura Vida! Thank you for this amazing review. We always want to make the stay of our guests very comfortable and it is great to read that we made it. And we love to do this. We think it is disrespectful of the host when the guests have to wait long for an answer. Our goal is to have happy clients. The condo was extremely nice and clean and had lots of space! The owners were very helpful with everything! They were kind enough to meet us in town so that we didn't have any trouble finding the place. They were always quick to respond with any questions we had! The place is a very quick walk to the beach and several shops and restaurants! Thank you, Kelsey, for this awesome review. We like to do everything to ensure that our guests have from the beginning a carefree holiday. This includes, of course, that we lead them to the house and at any time to be available for questions and or tour bookings. We are pleased when you come back. This place was everything we could have asked for and more! I recently traveled to Tamarindo with three friends and this was the perfect place for us. It was great having a small pool and deck area to come to after the beach. It is in a great location and you can walk to the beach and the heart of the town easily. One of our favorite places to eat, The Shrimp Hole, was just right around the corner and is a great place to pick up food after a long day in the sun. The owners were great and when I am in Tamarindo again I hope this place is available! Thank you for this great review, Danielle. It was a pleasure to have you 4 ladies here and we hope you spend the next stay in Tamarindo with us. Located in the center of Tamarindo but still very quiet. It's the perfect spot to stay and to enjoy all activities Tamarindo has to offer such as Tamarindo fishing charters, diving & snorkeling, horseback riding, sunset cruises, ATV Tours, Ziplining and of course surfing and surf lessons. A car is not necessary! We strive to make your vacation as comfortable as possible, we will arrange your activities and all our guests will get a discount if booking a tour with us. Check in is at 4:00pm. Check out is at 11:00am . If you need a late check out please ask us and if there are no other customers checking in we can allow the late check out, however there is a late check out fee of $45 to pay for the cleaning ladies extra hours and transportation. Please keep all noise levels to a minimum after 10:00pm The use or possessions of any illegal drugs are not permitted on property. If you would like to have outside guests visit the property please send us an email with their name and id number ahead of time. Absolutely NO prostitutes are allowed on property. We reserve the right to not allow certain visitors access to the property. Feel free to use the outside showers to remove any extra sand before entering your room. Please DO NOT take room towels to the beach, we have beach towels available. $30 Fee for Beach Towels Not Returned. Pets must be approved by the owner before arrival and a $200 cash deposit is required if approved. Smoking is ONLY permitted in the outside patio area. We are an eco-friendly establishment, please help us by conserving water and electricity: Conserving Electricity: Please turn off the A/C or fan when you leave the room & please keep doors and windows closed while in the room with the A/C on. Please treat this house as you would your own, unless you are a complete mess, then treat this condo as you would your inlaw's house....unless you don't like your inlaws:)....all we ask is that you respect our home and enjoy yourselves! Pura Vida!